Last week was my first week back at work. Monday night was pretty tough as I was preparing to return. Let's just say there was a lot of tears! Parker is being watched by a neighbor so it was a pretty smooth drop off. We did it quickly so I wouldn't be able to dwell on any sadness. Everyone asked me how it was to be back at work and I just had to say that we couldn't talk about it (I would have started crying!) I did get a misty a few times, but was able to hold it together pretty well. I think it helps to know he is with a trusted friend and not a stranger. It will be a new adventure each day as we try to adjust to a new schedule and routine. Here is P's picture from last week! I can't believe how much he is growing up each day. We did demo in the basement this week! The paneling is gone (Thank Goodness!) The acoustic tile ceiling is gone! And the carpet will be gone this weekend! A good friend of our who also happens to be an electrician came out and did some amazing light installation on Tuesday. We had two bad light fixtures before and one of them didn't work so this made a huge difference. Drywall is being installed next week and soon after that will be paint, carpet and furniture! We are so excited to have another hang-out space and more room to have friends over! The Herrmann house has been busy! I spent this last weekend working on some aesthetic updates to our bathroom. 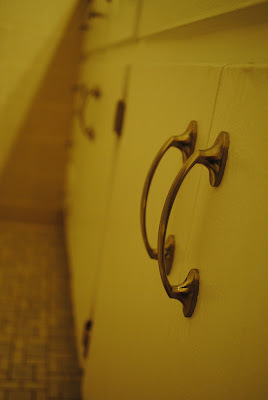 I painted the vanity white and replaced the brass hardware with nickel. I still need to replace the beige TP holder and will be replacing the sink, faucet and counter top soon! Next on our to-do list is our basement family room! This room just screams 1975 and I am so excited to get started. We are tearing down the ceiling and paneling, installing recessed lighting, putting up drywall and replacing the carpet. We don't have any carpet on our main level so it will be a great place for Parker to play and learn to crawl and walk. We already have our new couch purchased and can't wait to get started. It will only take a couple weeks to finish! Below are a couple before pictures. This week is also my last full week of maternity leave. I am trying to soak up every moment I can with Parker. The last 11 weeks have been so amazing. While going back to work is going to be hard, I know he will be in good hands. 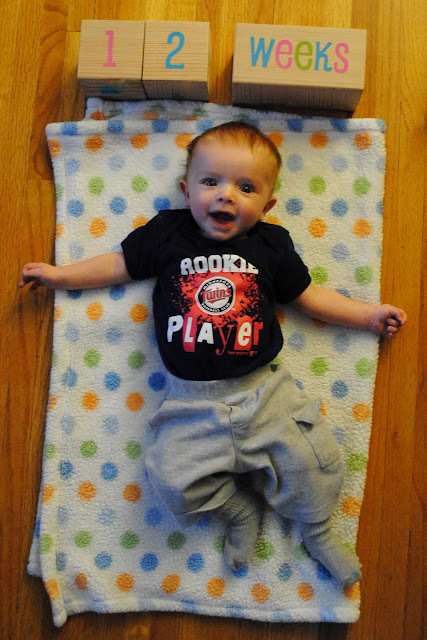 I can't believe how quickly the time has gone, my little guy is growing way too fast! I will always cherish this time we had together. Today was Parker's 2 month check-up. All things considered he did really great! First was his weight and length check. He was very long and lean at his newborn check-up so we were happy to see that he is starting to average out more. He weighed 11 lbs. 7 ozs. 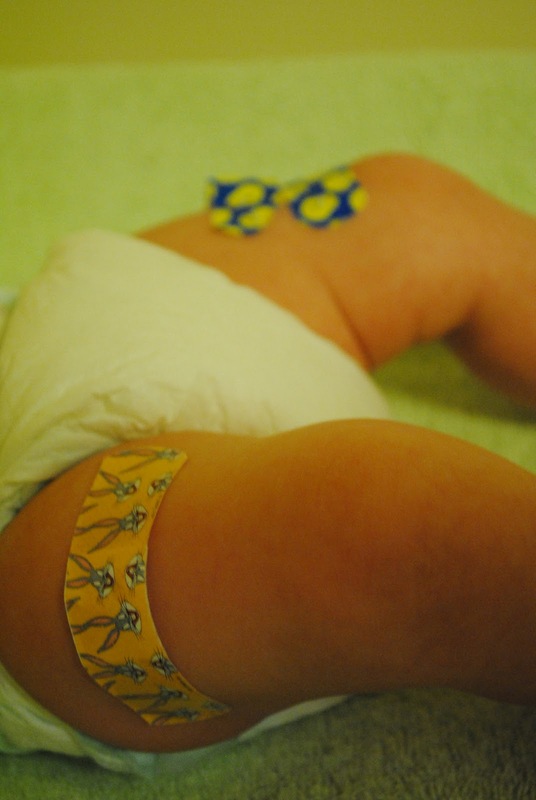 (36th percentile) and was 23 1/2" long (64th Percentile.) The doctor was happy with his growth and told us to keep on trucking with what we are doing. Next was the physical exam. She was surprised to hear how much rolling he has been doing. (On a side note, he rolled from his back to his stomach a few days ago!) She did some additional checking because early rolling can sometimes be an indicator of other things to be concerned about, but he was fine! She then went over the vaccines that he would get that day. 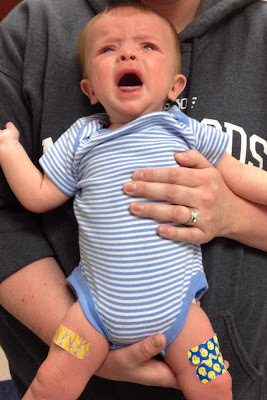 He got tongue drops for Roto-virus which is a stomach bug that can be particularly harsh to infants. Then he got 3 shots of combined vaccines for Diphtheria, Tetanus, Pertussis, Hepatitis B (second dose), Polio, Hib (a type of influenza), and Pneumococcal. It was hard to see my little guy crying, but I feel it is the right choice for us to have him vaccinated. I am so happy that he is doing well! Parker, Jimmy and myself went to our first ECFE class tonight. Early Childhood Family Education provides support for parents and an interactive play environment for children. Sessions are determined by age so you are always with other families that have kids in the same age range. Our current session is the birth to 5 months group, but all of the babies in our class are 2-3 1/2 months old. We started the evening with introductions to get to know the other parents and babies. There were 6 babies total: Sophia, Ilana, Genevieve, Willa, Simon (his middle name is Danger!) and Parker! We also sang a welcome song to each baby. We sang a couple more short songs that have actions that we helped Parker do. This helps to promote healthy movement. We also spent part are the night discussing positive things about our parenting journeys and sharing struggles we have had. It was so great to talk openly with other families that are in the same place as us. It is also comforting to know that we are not alone in man of our struggles. I am so excited to go back!